So friends, not only are we more than half way through this pregnancy of mine (say what?!? 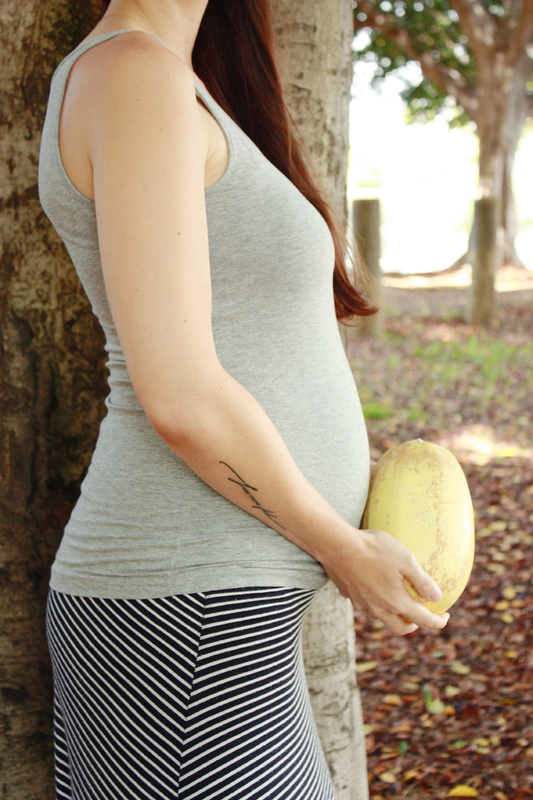 ), but you guys- Baby Main is the friggin size of a spaghetti squash! Someone needs to seriously come and pinch me because things are just moving so fast and getting so real. A spaghetti squash friends. A freaking humungous, heavy, and very delicious, squash of spaghetti. I can't believe it. I know for a fact every week's size increase is going to shock me like this, haha. And all the moms before me said together, "Wait until the end and you're pushing a watermelon out!" Yeah, yeah, I know. 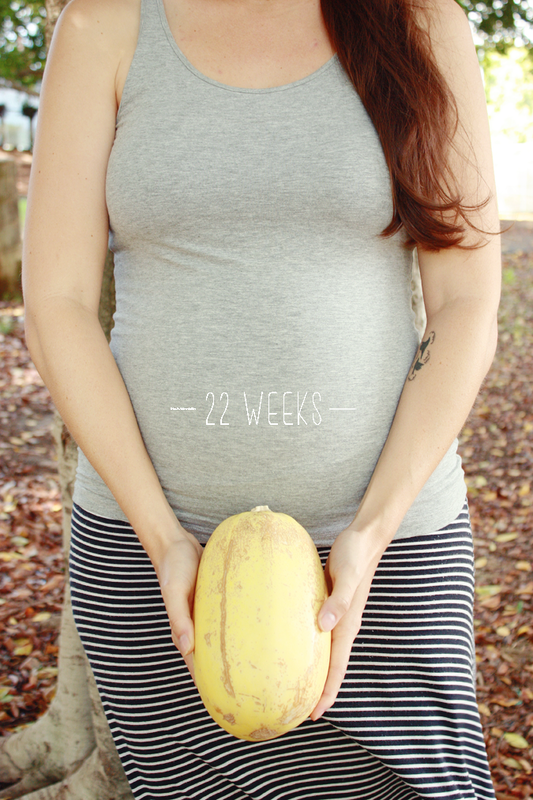 I love that he is the size of a spaghetti squash this week because it's been on our dinner table frequently! I'm so in love with the veggie that we've been eating it like crazy. Maybe that's morbid actually. Whatever. It's neat and I love it and I love spaghetti squash and I love Baby Main. So there. Man oh man has my appetite come back, with a vengeance might I add. I feel like I am hungry ALL the ding dong dang time. I literally cannot go an hour without needing food in my face. I'm really trying to make this the healthiest pregnancy I can, so I try and make sure whenever I'm hungry I eat a variety of foods- especially protein and calcium. This is proving WAY harder than I thought it would be. All I want are carbs and sugar. So come dinner time I'm way above my carbohydrate and sugar intake and way below my daily requirements for calcium and protein. Grrrr. So, whenever I'm hungry I have to really force myself to grab some chicken or milk instead of toast and cookie butter. Sad face. I'm starting to really become excited to see our little man. I find myself almost not being able to stand it and getting pretty anxious that it's still 18 weeks (or so) away. I even had a dream the other night that I DID see him! He was amazingly beautiful and had the thickest head of dark dark brown/black hair. I guess, kind of like my hair color, but a tad darker. It was awesome. I've been praying a lot more for my husband, his heart, protection over his mind and against any doubt that might creep in, his job situation, and that the Lord would just continue to provide him with wisdom and discernment during this new season of ours (and forever, really). I couldn't imagine (nor would I even want to) being the head of the household, particularly when a little one is on it's way. Sheesh. Hahahahahahahahahahaha. Sleep. Yeah, sleeping has become an interesting thing. I feel like my "sleep" has become more cat nap like. I sleep a little bit here and there throughout the night and if need be, during the day. Good news is, the weird little bit I do get through the nights have actually for the most part, been enough to get me through the day. I finally graduated to a huge body pillow, a pillow for between my knees, my head pillow, and one wedged against my back. I toss and turn back and forth between the giant pillow which allows me to sleep a bit more forward, taking almost all weight off my hips (ahhhhh, amazing) and then over to the littler pillow against my back which allows me to "sort of" sleep on my back. Well, my back/side. Anything to get me off of my hips directly is a good thing. Still wearing my regular jeans (fitted with the BeBand, of course- there's no getting that button even remotely close to closed), t-shirts, tanks, maxi dresses and skirts, and my two or so pairs of maternity jeans. I'm pretty happy with the fact I can still get my old pre-pregnancy jeans up...hoping to be able to "wear" them throughout. The fun new thing is shoes. I have officially reached the point where getting socks and any sort of tie shoe on, is a joke and extremely uncomfortable. So I usually stick to slip ons or sandals. It HAS been a bit cooler here on a few occasions, to which I wore some moccasins and boots. My lovely husband had to put those on for me, haha. Such a sight! Still feeling pretty good body-wise! Although I am starting to feel the new baby weight and have had to scale back the length of time we go walking because after a little bit, my pelvic bones start screaming at me, and continue to do so for days afterwards :( Biggest bummer right now. So I'm switching it up to yoga and pilates for exercising, as of now. I CAN FINALLY FEEL BABY MAIN! Not only that, but so can Bill, which has been the neatest thing. I've been able to feel him for a few weeks now. And although I thought I'd never be able to tell the difference between gas bubbles and him, I certainly can! He's quite the busy body in there making some pretty big kicks and/or punches! I love it! At first they were the weirdest little things but now they've gotten stronger and stronger and I sometimes have to stop what I'm doing and look down at his home and laugh. "What the heck are you up to, little man???" Since they've gotten so strong, whenever he's up to his shenanigans, I immediately grab Bill's hand, shout, "FEEL! FEEL NOW!!" and have him rest it on my tummy. 40% of the time, he can feel those kicks! It's AWESOME. I mean, literally the coolest thing this pregnancy. Now it's not just me, you know? He's actually, physically, a part of it as well. Not that he wasn't before- but it's different. Bill can feel the baby too- it's not just all in my body. Such a fun experience. You are so cute, friend! I cannot believe how fast time flies. Two of my coworkers are preggers and well...one is due mid-december, and she was telling me a story of how she got boots stuck on her swollen foot and couldn't get it off. Haha. Bless her. At least she is laughing about it now. :) I'm so glad you are doing well and Baby Main is growing and healthy! Still praying for you guys! Ahh, this is so exciting! I can't believe you're already 22 weeks! You are looking absolutely stunning! You're telling me! I can't believe it's gone by this fast. I am right there with you. The time is really going by a little too fast. Boots are no joke! Lucky for me, my feet are still pretty much the same. It's bending over and getting them on that's hard! I'm still in shock over all the weird things you can and can't do while pregnant. "But I could _____ just two weeks ago!" is a common phrase out of my mouth! Aw, I love these posts. They seriously make me so happy! You have so much joy that it's contagious! During my pregnancy these next couple weeks were when I felt my best! It's such a fun time once you know what you're having and can start to feel him moving around. My little man was such a monkey, he made my stomach look like an ocean with all of his moving around, and he really is a little monkey now! It's so fun that you can kind of tell their personality even while their in your belly! <3 Glad you seem to be doing well! Wow, I can't believe you're already halfway there! 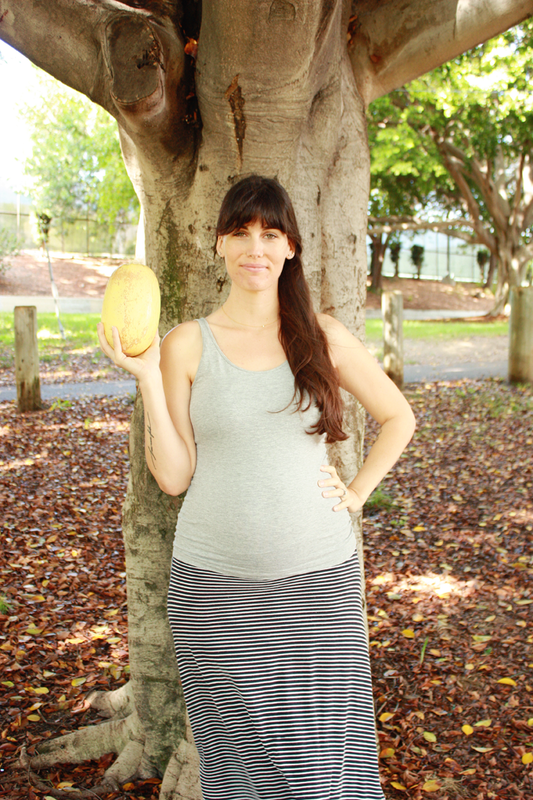 You look beautiful, and I'm loving your maternity style! Do you know yet if you're having a boy or a girl? I remember wanting to see my little man SO bad too! When we finally got the ultrasound picture I put it on my phone as the screensaver because I couldn't help but stare at his features any time that I could. Thank goodness for those ultrasounds...it helps with the waiting. Just wait till the baby stretches! It's an alien type of feeling.